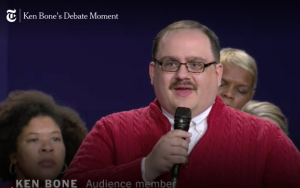 In the midst of the most contentious and frightening Presidential Debates in American history, Ken Bone and his red sweater became heroes – and memes. Are we fiddling while Rome burns, or just in desperate need of comic relief? Bone an operator at a coal plant in Illinois, was one of the undecided voters selected to ask a question at the town hall debate broadcast live on Sunday night. He asked Hillary Clinton and Donald Trump about their energy policies. Ken Bone’s Twitter following blossomed to 135K in the days following the debate where America fell in love with him and his red sweater. Bone is now urging people to get out and vote as he makes the interview rounds and enjoys his new-found fame. He still claims to be undecided. It’s quite likely his new fame will disappear as fast as it came if Bone should decide and share support for the trash talking Trump. Bone told CNN he changed to the sweater from a suit because the pants of the suit ripped when he got into the car and he had to go back and change. (How cute is that!?) Apparently, he’d gained about 30 pounds since the last time he wore the suit. Stephen Colbert and Jonathan Mann both wrote songs toasting Ken Bone.